Midfielder Dale Stephens felt Albion’s quick response to Tottenham taking the lead was crucial last night. Brighton were level within two minutes of Harry Kane giving Tottenham the lead as Pascal Gross levelled from the penalty spot. Stephens said: “The way we conceded was disappointing. “We’ve conceded previous goals against the run of play and our heads have gone down a little bit, so it was nice to hit back really quickly. “It set us up with quite a strong finish to be fair and I thought a point each was a fair result. Stephens added the performance will give the team confidence heading into the final four games of the season and said: “We’d looked at this game and thought it would be hard to get anything out of it but we put in a shift and we’re pleased with a point. “The boys are shattered but we knew it would be like that. When you play against the top teams, it’s important everyone digs in and puts in a shift for the team. “That was the only way we were going to get anything out of the game and we’ve done that tonight. “We’ve been decent all season at home. We knew tonight if we went after Tottenham we had a chance of putting on a good performance. 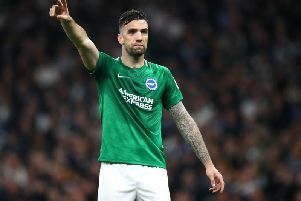 “We’ve done that and shown we can do it against the big teams and it gives us confidence for the remaining fixtures.” On the remainder of the season, Stephens feels one more win will seal Albion’s place in the Premier League. He said: “We knew we had tough fixtures (to finish the season) but we’ve got a good squad, a good team and we were always confident we could go into these remaining fixtures needing points. “That’s ultimately what we need to do now, 36 points is good but we still feel there’s a bit of work to be done.